She put her's in a large planter that she could move around. She searched for just the right container so that her kids could get all around it and play - such a great idea! Now, I don't know if you can see it or not but her Fairy Garden is basically like an I-Spy game. There are animals in the plants, Fairies hiding behind rocks, little treasures here and there. It's awesome! If I remember right I think she even mentioned that her fairies will go and visit the neighbors fairy gardens and little things in her garden just move around all summer. So fun. 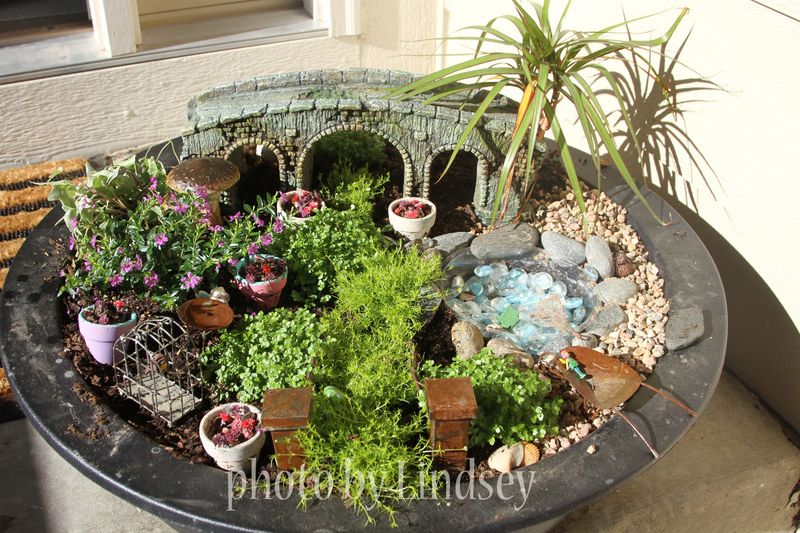 I know my girls could really have fun with this so I'm letting go of my fears of being a plant killer and when school gets out next week, we are taking on a fairy garden as one of our little projects. I'm sure there are tons of ideas out there and I'm excited to get started. Please share your tips. 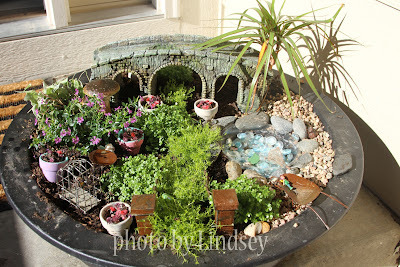 thanks for posting the picture, I really had never heard of a fairy garden. so cute. i think i'm going to have to give this a try. i am also the type that can't keep plants alive. Gully's Nursery on S. Shields, just north of Trilby, has (in the past, I haven't been there in a while) a large fairy garden inside with lots of ideas.